We tested most popular 8 wireless Qi chargers to select the best wireless chargers for iPhone 8, X, 8+ and Android smartphones (Samsung Galaxy S9, S8, S7and Note 8). Wirelss charging offers a very convenient and hassle free means to charge your phones while ensuring that the phones are easily accessible while charging. The Qi Wireless charging standard has evolved over the last few years. Till recently, 5-watt wireless charging was the norm. However, new smartphones such as iPhone X, 8, 8+ and samsung Galaxy S8 and S9 have introduced fast wireless charging. For iPhone X, 8, and 8+, fast wireless charging mode now till 7.5 watts of power draw. For samsung S8, S8+, S9, S9+, and Note 8, fast wireless charging draws up to 9 watt of power. Many latest Qi wireless chargers in the market now support fast charging for both Samsung phones and the new iPhones. An useful point here is that both these fast wireless charging modes only offer modestly faster charging times that are about 15 to 20% better than regular 5 watt wireless charging. So, while a 5 watt charger will take around 4 hours to charge a phone like S8, a fast charger will save about 30 minutes to 45 minutes and take about 3 to 3.15 hrs. This is the reason why we have also included well performing 5-watt chargers also in our list. Many wireless chargers come without an AC brick. We have tested these chargers with our favorite two AC bricks and listed them accordingly. Other than charging performance/speed, we have also taken into account the robustness of build quality, warranty/service support, ability to place devices flexibly and sleep-friendliness of the chargers’ LED lights into account as well. Anker PowerPort 5 Wireless charging stand has a small sleep-friendly LED notification light. Multiple charging coils mean in PowerPort 5 mean that you can choose to place your phone either in landscape mode or portrait mode for charging. The charger can handle protective cases of up to 5 mm width – better than all other chargers in our list. This makes it a reliable wireless charger without the need to take the case off. Very attractive price even after bundling with a wall-charger such as Anker dual 24 watt wall charger. Does not come with a compatible wall charger. However, one can easily buy it with an excellent wall charger such as Anker dual 24 watt wall charger. RAVPower Fast wireless charger Pad is a fast charging wireless pad. This means that it supports both the fastest 7.5 watt wireless charging supported by the new iPhone X, 8, 8+ and the 9 watt fast wireless charging supported by the Samsung S9, S9+, S8, S8+, Note 8, S7. It will also charge other non-fast charging compatible smartphones at a decent 5 watt speed. 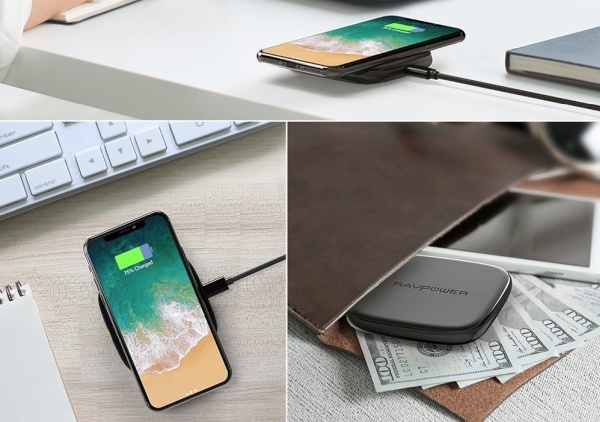 The RAVPower Fast wireless charger Pad is a lightweight and compact charging pad that weighs just 2.8 oz making it ideal for carrying while travelling. The charger ha sa non-slip charging surface with a small LED chargings status notification light which does not light up the room like other wireless chargers with LED rings etc. The wireless charger comes conveniently bundles with a compatible 2 amp wall charger. The RAVPower wireless charger Pad will fully charge iPhone 8 in about 3 hours and the Samsung S9 or S8 in 3.5 hours. Phone has to be kept horizontally with screen facing up. A stand type charger allowing easy viewing of display is more convenient. Single coil charger – Single coil chargers require more precise positioning of phones on them than multiple coil wireles schargers such as Anker PowerPort 5. Howeever, this is not a big concern as the flat grippy surface prevents the phone from moving once it is placed. 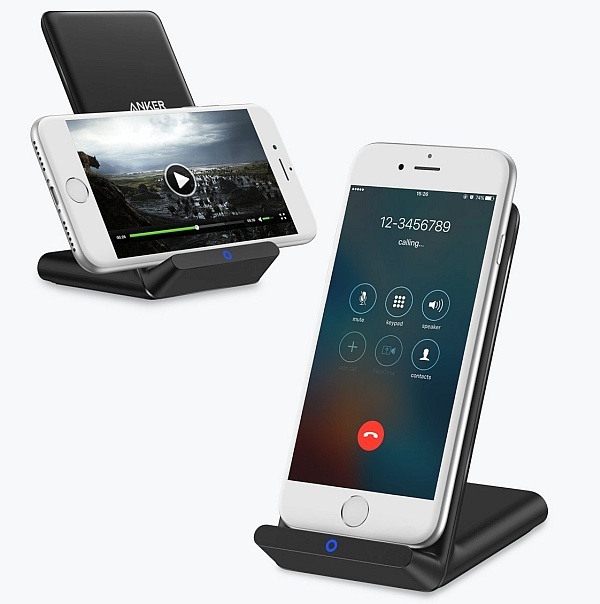 ﻿﻿ The Samsung fast wireless charging stand 2018 is easily a good elegant looking wireless fast charging solution for Samsung S9, S8, Note 8, and all other Samsung smartphones 9 as well as for iPhone X, 8, and 8+) that support wireless charging. The 2018 version of samsung’s official wireless charging stand is a much improved version than the 2016 stand. The new changes include a better matte-finish grippy charging surface with rugged leather look, small leep-friendly LED notification light compared to the big LED ring in the 2016 version, as well as an option to purchase a convertible stand that can be used both as a charging pad to place the phone horizontally or as a charging stand for placing the phone in an angled standing position for easy continuous viewing of the phone’s display and touchscreen for receiving calls etc. The Samsung fast wireless charging stand 2018 features an eye-catching design, good build quality, and complete wireless charging package (with am included wall charger) . 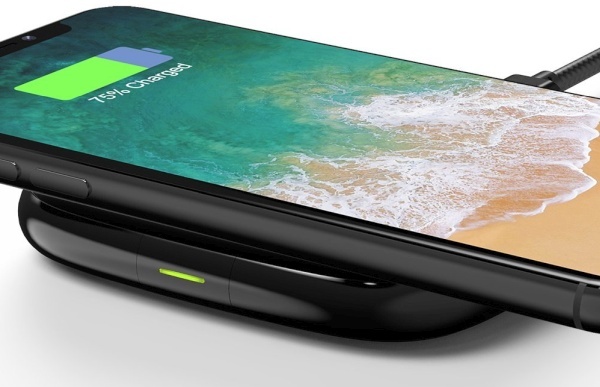 The Samsung wireless charging stand is also a great wireless charging solution for iPhone X, iPhone 8, and iPhone 8+ on the basis of build quality alone, even though it does’nt support the 7.5 watt fast charging for iPhone X, 8, 8+. There is hardly a 30 minute difference (3 hrs vs 3.5 hrs ) between fast wireless charging for iPhone X/8 and charging it on Samsung fast wireless charging stand 2018 and we think this is too little difference to matter much in real life. The Samsung charging stand 2018 comes in 3 colors (though the stock varies) and also looks much elegant the earlier 2016 version. if you have purchased a Samsung wireless charger, please look for Samsung hologram on your shipped Samsung charger and register the product on Samsung website to confirm that it is genuine.